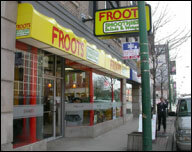 Froots Smoothies franchise business opportunity. Free Froots Smoothies business franchise information. At Froots, we're passionate about serving great-tasting Smoothies, Shakes, Salads and Wraps for the exploding population interested in a healthier lifestyle. We serve delicious, nutritious, all-natural, energizing Smoothies and Shakes along with gourmet Salads and Wraps. The Smoothies are a healthy and refreshing drink for a nutrition-starved body. The Salads and Wraps are a perfect complement to the Smoothies and Shakes providing customers a healthy and delicious alternative to the typical fast food breakfast, lunch and dinner fare. After several years of refining and developing the product and the concept, Froots has become the premiere choice for healthy and active consumers on the go in <?xml:namespace prefix = st1 ns = "urn:schemas-microsoft-com:office:smarttags" />South Florida. We have now expanded across the country as we introduce the positive benefits of the Froots brand to consumers in many new markets such as Chicago, Atlanta, Ft. Lauderdale, Miami, Orlando, New Orleans, Washington D.C., Northern Virginia, Nashville, Louisville and Phoenix. Over the next several months, more and more Froots stores will be opening in retail storefronts and shopping centers throughout the United States. Comprehensive Training - You will be fully trained in all aspects of our smoothie blending procedures and salad and wraps preparation. We make you comfortable with the entire process and completely prepared to open the doors to your franchise business! No restaurant or retail experience required. Operations Manual - This is your "how-to" guidebook containing all of the information, recipes and procedures you'll need to operate your business in an easy-to-follow format. Site Selection - We take a very "hands on" approach to the site selection process. While most franchisors will only provide you with guidelines to pick a location on your own, we will actually assist you in identifying a good location for your Froots franchise unit. We evaluate the demographics in your area of interest along with the overall economics of the deal to try to provide you with a number of location options for your business! Marketing Support - In addition to Froots sponsored regional marketing campaigns, we supply you with attractive, highly professional consumer marketing and advertising materials to be used in your store. We also provide you with promotional and publicity techniques customized to your local market that you can implement right away! Corporate Identity and Logo - You will share in our name recognition, our logo and in our other trademarks. They signify our commitment to customer service and the highest standards of excellence. Ongoing Franchise Service and Support - We are always available to answer your questions and address your needs. You'll be visited by a Froots field representative on a regular basis and we will constantly offer you business advice and support. To learn more about the Froots Smoothies, Shakes, Salads and Wraps franchise opportunity, simply complete the form below.